Why We Teach - Compiled by Margaret Olmsted (Sep 2018) | Tai Chi Foundation Inc. Recently some of the senior teachers of our school were asked why we teach. Below are some responses. In general, we teach for the love of tai chi. We teach in order to be of service to humanity. We teach to help people improve their health and wellbeing and because it improves our own health and wellbeing. And we teach because that is how we learn. To learn more, continue reading. Our school is designed to teach teachers so that the benefits of tai chi can reach more and more of the population. The benefits of tai chi come from practicing it. When we teach, we derive more benefit. The more we embody the benefits, the more we can transmit to our students. This transmission to our students is a constant reminder to us that being in service is the highest state of Being for a human being...to offer authentically all we have embodied for the benefit of all. We teach because we love doing tai chi and sharing tai chi. We love the body-to-body non-verbal communication in our way of teaching. It’s neat to see the “lightbulbs of recognition” go off in people’s heads when they comprehend the message in their own body and have a more essential experience of themselves. We learn more when we teach, both about ourselves and the art. And we find out what we don’t know as well! When we teach, we call upon ourselves to live and to be at our best level of embodiment. We often feel more grounded, centered, rooted (i.e., connected to the heavens above and the earth below) after teaching and are able to move through the day feeling that. It is joyful to be of service. When we teach, we feel the effect amplified beyond the immediate, personal “feel good” experience. We open ourselves to the undeniable flow of Barakath (blessed heavenly energy, like love) that is not ours to keep but instead, passes through us. When teaching, we become the function of messenger, the clearest possible channel for that tai chi message to be transmitted through. After I teach, I feel simultaneously relaxed and energized from stepping into that Barakath “shower" and entering into a calmer, deeper, more expansive state of being. Teaching others teaches me. Teaching is a service to other beings, and therefore what I feel I should be doing with my life. Tai chi is the field I know best and the lens through which any understandings I’ve come to in my life can best be understood, transmitted and passed on to others. It is when I am in the room with students that I have new understandings of tai chi, of how it works in my life, or how it works in my body, and how the practice can change and heal us. Each class I teach is a moment in the week to get out of my own way because the channel is there from me to the students. In any teaching there is a connection and a transfer, a giving and a receiving. Like a mother you hold your students, not in your arms but in your dantian. Personally, for me teaching is like consuming food. Looking back at my early teaching experiences, I liken them to wolfing down a plate of food due to my hunger for learning−satisfying yes, with some nourishment also. Over years of teacher trainings, I am now learning to chew, savor and digest the essence of what tai chi has to offer. From the one, you begin to connect to all. Teaching nourishes me to such an extent that I want to share a bountiful plate that I cannot eat alone. The beauty of teaching tai chi is that there is always something new to savor and digest. The simplest and most direct answer is that I love teaching, especially when I see students “getting it”. I experience inner joy in passing the indications for work that has been so important, transformative, and long-lasting for me. What else can I do? Keep doing it as long as I can. I teach because it makes me feel good when I teach or do tai chi. Teaching helps me understand tai chi better and think about it in a way I wouldn’t ordinarily if I were just practicing. And then there is the beautiful part of teaching and the satisfaction in conveying something really simply and elegantly; in breaking it down so it is easily understandable and grasped by the different people I am teaching. It is also a service to humanity. I do tai chi because I feel good. It is a by-product that it is of service – and a good one! We teach because we feel the benefits of tai chi and want to share them with our brothers and sisters. The Buddhists call this compassion. Teaching also provides a gentle pressure to improve, or at least maintain, our level which increases the motivation. Teaching a class reminds us to practice. It gets us moving. We meet interesting people. We get the high that comes with being a conduit of a transcendental practice. Tai chi has given me many blessings and good things both on the physical and spiritual plane. I teach because I want to pass these teachings to others. I also want to imbed a sense of self, health and well-being in and to those I teach. Our school is designed to train teachers because we are continuing the intention of Cheng Man-Ch'ing—to bring the benefits of tai chi chuan to as much of society as possible. We teach for any number of reasons: to help others through participating in the mission of the school; to improve our own tai chi and our own lives; to learn by teaching; to follow a Taoist and/or Confucian path. I teach because I have been successful at it. The attention and respect of my students make me feel successful. Students enjoy the classes. Watching them learn the tai chi Form and advance in their skill and depth of practice satisfies me. It helps my health and strength. My balance is better when I practice and my coordination is good for a person of my age. Tai chi teachings and those from other spiritual traditions blend together and make a philosophy that guides my behavior and thoughts. There is an element of mystery about tai chi. The teachings of my teachers are something I would never think about on my own; they have opened my mind to higher levels of experience and knowledge. After 41 years, close friends and many brothers and sisters in the school are very dear to me. As I grow older the friends seem to grow wiser and more loving. My appreciation of aspects of tai chi change from time to time. Now I appreciate Push Hands more and feel I can improve and learn to be more at ease with people and at home in myself. There is great joy in being with fellow teachers at trainings and in classes. Our school is designed not only to teach tai chi but to train teachers. This was the vision of its founding director, Patrick Watson, with the support of his two primary teachers, Oscar Ichazo and Professor Cheng Man-Ch’ing. We have developed a very systematic way of training people to teach in teams. Our unified methodology illustrates that we are bigger than one person’s dedicated or inspired efforts and that we are able to disseminate embodied wisdom through “social transmission". 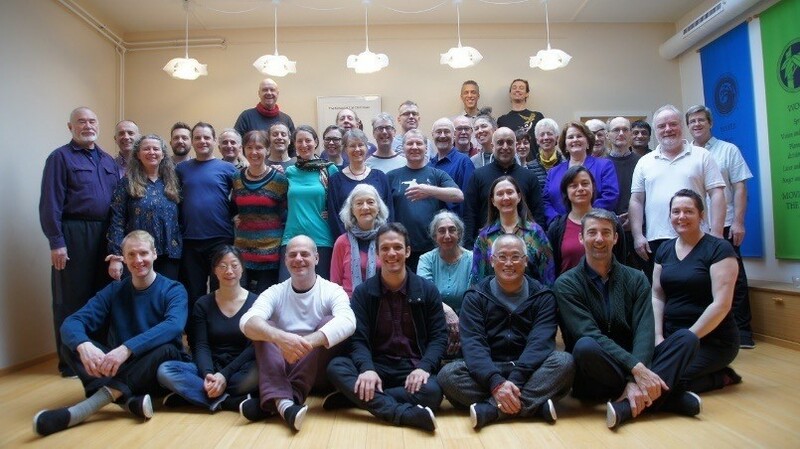 We are a community not only of fellow teachers, but also of fellow companions on the Path and we understand tai chi’s true potential to bring us to that deep state of relaxation, ease with ourselves, and heightened awareness, that all together are the hallmark of awakened consciousness.